A good warming curry is one of our favourite things to eat in cold weather. And since the sun has decided not to shine (well at least in Sydney) we are in the mood for more ‘fall food’ and ready to enjoy good warming dishes for a little longer. We promise, there is nothing fancy about that Coconut Pumpkin Curry recipe. But be prepared to get a standing ovation from the whole table! Sometimes, being able to transform a bunch of everyday ingredients into a mouth-watering dish can feel like culinary sorcery. 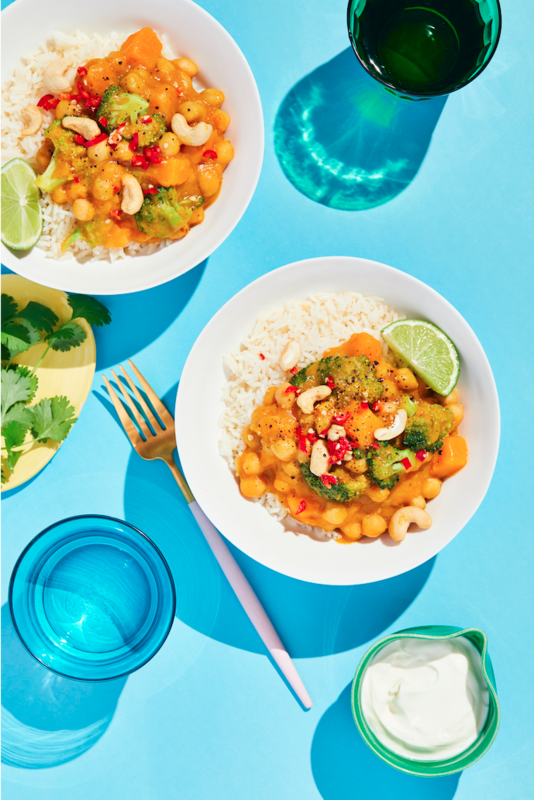 Using the Hart & Soul Coconut Pumpkin pouch as a base, this curry is super simple and quick to make. Sometimes speed and handiness are more of a consideration… The result? A warm, creamy, rich and coconut-y bowl of goodness. We are so pleased with the final result, we can’t wait for you to make it yourself! In general, curries (like stews), tend to gain more flavour over time. Make this dish ahead and we promise that you’ll have a sudden urge to lick your plate! Heat oil in a large pot over medium heat. Sauté garlic until fragrant. Add the Hart & Soul Coconut Pumpkin pouch, pumpkin cubes and curry paste. Bring to the boil. Turn heat down to low and cover. Simmer for 15 minutes. Stir in chickpeas, cashews, and lime juice. Serve with Rice or your favourite flatbread.